PARKING: A dirt parking area can be found on Rt. 121. There is a gated fire road directly across the street. MAP: (Mine Hill) The red polygon on the map below is posted private property. DESCRIPTION: Follow Fire Road 42 (recently logged) to an abandoned set of stairs. Climbing the stairs will bring you uncomfortably close to a house although you are technically still on public property. I descended and bushwhacked along a deer trail on the western ridge to a Southerly slope then ascended to the remains of the old Devil's Den fire tower. The only remains are 4 trapezoidal shaped cement blocks in a square pattern marking the base of the tower. 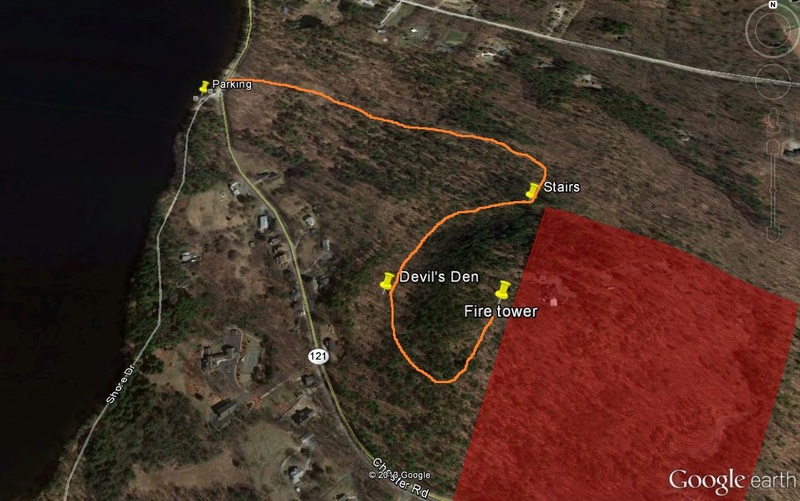 Fire Rd 42 to Abandoned Stairs = 0.42 Mi. Abandoned Stairs to Devil's Den Cave = 0.15 Mi. Devil's Den Cave to Summit = 0.13 Mi. 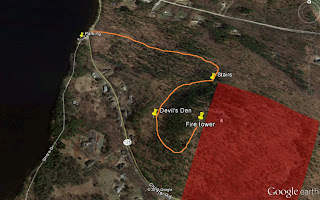 NOTES / COMMENTS: After analyzing maps and Google Earth images I was intimidated by Mine Hill due to the nearby house and private property but after reading the history of Mine Hill Fire Tower and performing research on the Devil's Den Cave I couldn't resist paying the area a visit. I'm glad I did as there is a plethora of features worth exploring in the area. The area is technically public however uncomfortably close to a nearby house. Abandoned Stairs - N42 59.467 W71 20.205 - I'm assuming these provided access to the fire tower. Mine Hill Tower - The tower was built in the 1940's and active until 1960. The remains stood until approximately 1990. All that remains are 4 trapezoid shaped blocks in a square pattern. Devil's Den Caves - N43 59.391, W71 20.348 - Devil's Den is worth a visit itself. Supposedly it's a haunted cave spanning 60 Ft deep into the mountain. According to a 1792 excerpt from the Devil's Den Cave link (above). "The cave is on the Southwesterly side of the mountain near it's base. Approximately 30 'rods' from the road." Since I don't typically measure in 'rods', I Googled the conversion. 1 'rod' equals 16.5 Ft making 30 rods about 500 Ft. I found a definite indentation in the land at the coordinates above. The distance from 121 is a little more than 300 Ft but I suspect the road from 1792 wasn't a paved route and probably in a different location than the current asphalt road. You'll need to use a little imagination however I see the outline of a stone archway and the large hole could possibly be the entrance to the Devil's Den Caves.